A while ago I reviewed the Structure Sensor — a great and versatile 3D scanning sensor for the iPad. Today I’m testing the 3D Systems iSense. This device is actually a re-branded Structure Sensor, produced by Occipital, but used to be sold and supported by 3D Systems. This 3D printer manufacturer has used third party sensors before. The first generation Sense for Mac and Windows (Review) was basically a PrimeSense Carmine and the currently-available Sense 2 (Review) features an Intel RealSense SR300. The iSense has been discontinued by 3D Systems in 2016. It’s no longer sold by them directly, but resellers might still have stock. But the real good news is that you can find many unused iSense scanners at enormous discounts on Amazon and eBay — a new Structure Sensor costs $379 while I got the iSense I’m using for this review on eBay for $58 (no typo). But does that low price mean it’s suddenly a bad device? Let’s find out! Those discounts are actually the reason I’m reviewing a discontinued device. They raise many questions about the differences between the two devices, especially regarding the supported software. I made a separate iSense vs. Structure Sensor post — with many comparison scans — that answers that questions visually. So I won’t cover this subject here. One thing that’s important to know is that I found out that even my discounted iSense works with the excellent itSeez3D iPad app which I reviewed a while ago. It’s not totally free anymore but it does make better-looking 3D scans than the standard — but totally free — iSense app I’m reviewing below. 3D Systems’ iSense App for iOS works with iPhone 6, iPhone 6+, iPad Air, iPad Air 2, iPad mini 2 (a.k.a. with Retina display) or iPad 4th gen (a.k.a. with Retina display). I’m using an iPad mini 2 for this review. A old stone bust, a knitted teddy bear and a toddler sneaker on a book cover. My Lab: a trash can with an IKEA kitchen door panel and 3 small, cheap 65 Watts unbrella-style softboxes with daylight bulbs. And actual daylight from the window on a surprisingly sunny Dutch day in February. I put all the objects I regularly use in one scene because I have to scan it many times. According to this post by Occipital this means my discounted iSense was sold by an unofficial seller after the discontinuation of the iSense and will not be fully supported by them and not be able to use the Calibrator. If you have bought your iSense from 3D Systems or an official reseller in the past, you’re device is probably “unlocked” for use with the Calibrator app. If not, you can send an email to Occipital support to request this. For all tests in this post, I’m using an iSense that has not been calibrated with the dedicated app. It’s noteworthy that I bought an iSense bundled with an iPad Air 2 bracket. Maybe it was factory-calibrated for that device (calibration registers the offset between the infrared sensor and the iPad’s color camera). But I removed it from the bracket and put it onto the one for my iPad mini. You can see in the results below that not being able to calibrate it didn’t hurt the results. At least not for objects of this size. The first thing I noticed is that the iSense app is actually very polished. The user interface is clear and easy-to-use. 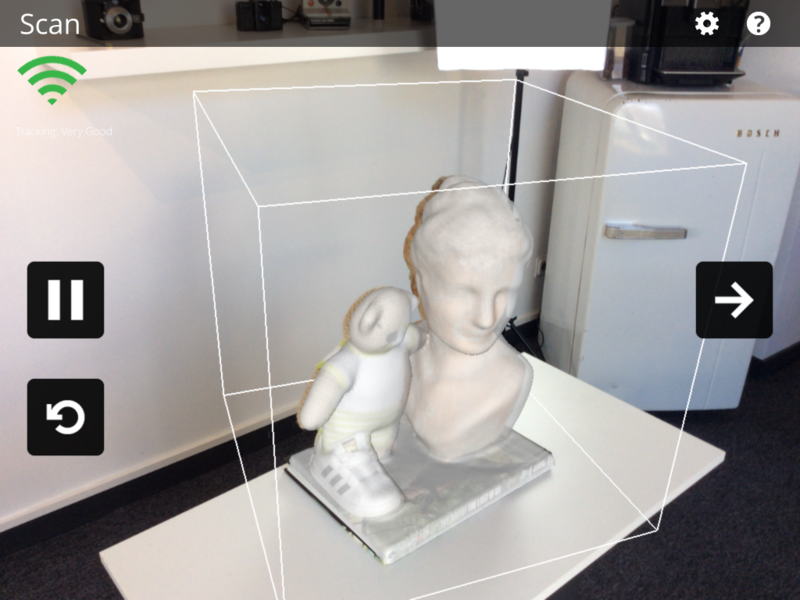 3D Systems has added a lot of features compared to Occipital’s Sample Scanner app. You can also use that app with the iSense, but you cannot use the Structure Sensor with the iSense app (in the past you could unlock this via an in-app purchase, but this isn’t available anymore). This app is the only iPad app for this kind of sensor with a Tracking Indicator (top left). If you try to scan objects without distinctive features (a chair or table, for example) this indicator will turn orange or red and the software will get lost more easily. For this example, I had no tracking problems at all. The experience was smooth and painless. It’s good to know that you can scale the bounding box with a pinch gesture for larger objects. I haven’t tested the app on an iPhone but the icons on the interface look big enough to be usable on a smaller screen. The unique thing about the iSense app is that it has editing features. 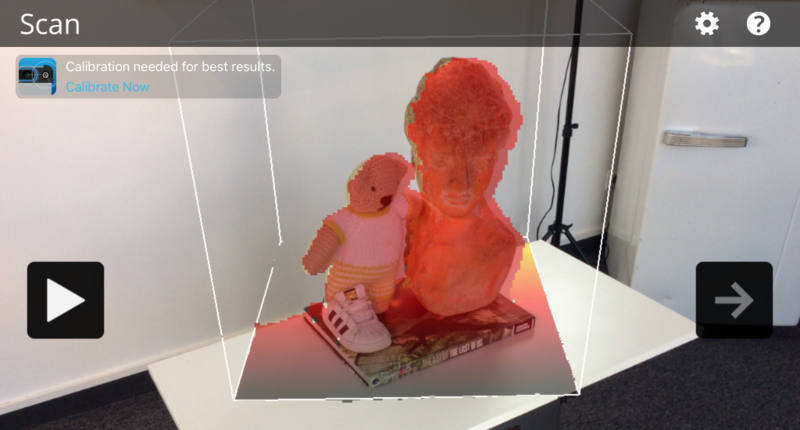 That might sound basic, but neither the Occipital Scanner app nor itSeez3D have them. If they’re necessary is another question, since they can all automatically remove the background and floor plane. But let’s take a quick look anyway. There are two screens, Edit and Enhance, but they both contain three random editing features. 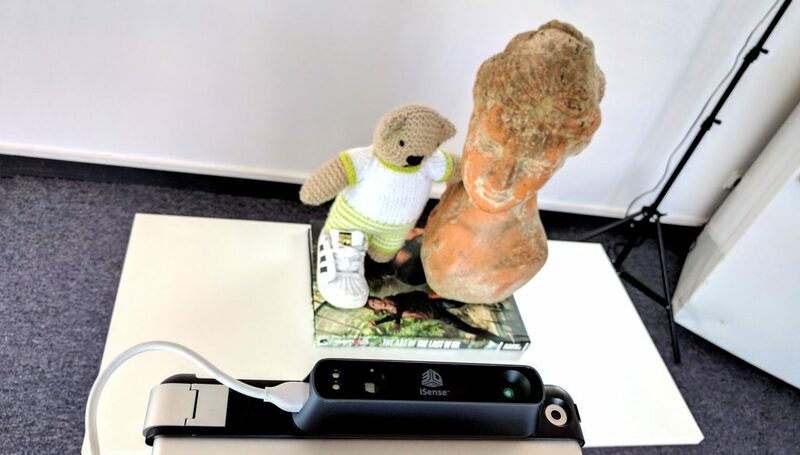 The tools are comparable to that found in 3D Systems Sense for RealSense Windows software (Review) that can be used with the Sense 2 3D Scanner (Review) — currently the only consumer-focused depth sensor the company sells. The Edit screen lets you Crop the model by making a rectangle. The Erase tool lets you manually remove parts and Solidify makes the model watertight for, for instance, 3D printing. While this is nice, there’s little reason why software like this shouldn’t do that automatically by default. While the second screen is called Enhance, it also contains editing features. Like a Trim tool that’s actually handier than the Crop tool in the previous screen. It cuts away the smallest of the two parts. Maybe it’s meant to censor 3D scans of people? In the final screen you can Save your scan. Before 3D Systems discontinued the iSense and the Cubify line of consumer-focused 3D Scanning and Printing products, you could share models through Cubify.com but this site is no longer active. 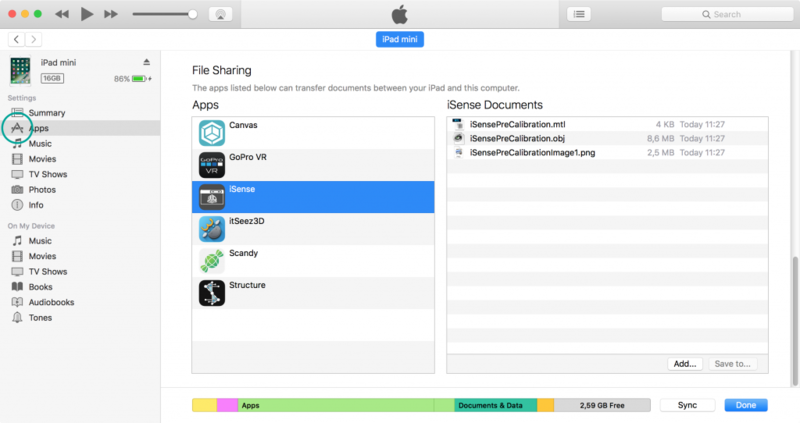 You can Save your model but unlike other apps that let you email the files to yourself or someone else, the iSense app saves the files locally on the iOS device. The only way to retrieve them is to connect the device to a computer with an USB cable and use the marvelous invention called iTunes. This part took me the longest to figure out for this review, so here are the totally ridiculous steps. After Connecting the iOS device, make sure you have the Apps section ticked in the dropdown menu in the top right. It’s unchecked by default. Click the tiny device icon next to the drop down menu to view the device’s contents. 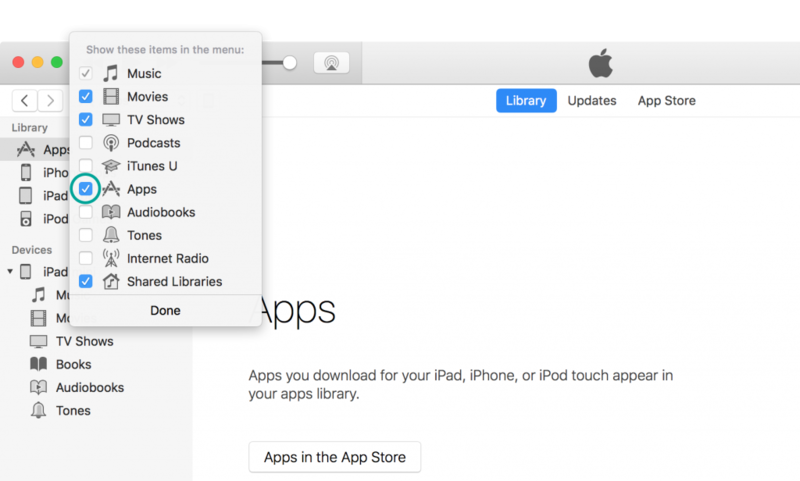 Then go to Apps in the drawer on the left and scroll down in the main panel until you find the File Sharing section. Select the iSense app and you’ll see all saved scans. You can drag and drop these to a folder in Finder. Be aware that the .OBJ, .MTL and .PNG belong together! If you want to upload them to Sketchfab for sharing like I did below you should put the 3 files into a .ZIP file. On a Mac, you do this by selecting them all, CTRL+Click or right click on them and select Compress 3 items. On Windows you should right click and select Send to > Compressed (zipped) folder. Upload the .ZIP. If you put the Sketchfab embed above in MatCap render mode using the gear icon, you can see that the geometry resembles the basic shapes of the objects, but is very soft overall. And although I used a 3-point studio light setup on top of a window with daylight — and moved very slowly — the textures aren’t very sharp. And by the way, I got the exact same results with an actual Structure Sensor. 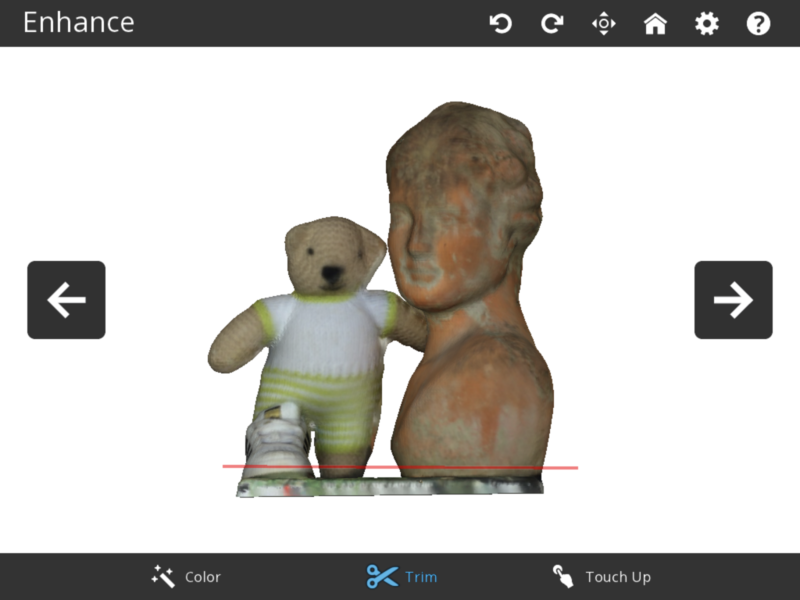 You can see those results and comparison scans from other apps like Skanect in this iSense vs. Structure Sensor post. I purchased the iSense because of the many questions I got about the huge discounts. I personally will only use it with itSeez3D because I like that app for its quality. But I wanted to test 3D System’s iSense iOS app anyway for readers that want to know if buying a ridiculously cheap sensor and using it with a completely free app is as good as it sounds. Actually, it is! If you use a good light setup (doesn’t have to be expensive) you can make decent scans for hobby projects and maybe even some low-budget professional ones with the iSense and the app with the same name. And if you want to get more out of it, you can always upgrade to itSeez3D and get better results (better textures, at least). Don’t forget that itSeez3D has a free version that might not let you download the 3D model files (this is charged per project) but does let you export and share your scan as a non-downloadable model on Sketchfab for free. Read all about it in my Review. As a final note, please do realize that third party software support is tested at the time of writing and might change in the future. The iPad Air bracket (so not the Air 2 one) will also fit on the new iPad that has been released in 2017. The RGB camera will be a bit off-center but it presumably works fine. A reader of this blog made a 3D printable bracket for the new iPad (2017) that you can download for free on Thingiverse! It has been tested with the iPad Air 2 version of the iSense and I think that one and the iPad Air version are the best match for the iPad (2017) since it has a similar RGB camera position. Apparently the iPad Air 2 bracket fits on the iPad Pro 9,7″ and the iPad Air bracket fits on the 5th Gen iPad (2017). I’ve updated the post accordingly. I also added a link to you Thingiverse design at the bottom of this post for people with a 3D printer (probably many readers). Thanks for the effort! I have both the Sense and iSense scanner. Problem is, the iSense app is no where to be found on the app store. Am i going crazy or has it been removed? Great review btw. You’re right! The iSense app seems to have been removed from the App Store! I’ll update my posts accordingly. Thank you for contacting 3DSystems Desktop Support! Currently the iSense App is not available for download on the App Store. We are working on getting the app available again with Apple. To use the iSense scanner in the meantime on your iPad use the app ItSeez3D. For the iPhone there is not another app to use but wait for the iSense App to be restored. We apologize for the inconvenience and appreciate your patience while the matter is resolved. Hopefully it will be back soon! Thanks, Ben! I’ll put that info in the post for other people with the same problem. I was wondering how you put the USB cable in to save to iTunes, without losing the connection with the iPhone scanner. Could you send a video? You have to disconnect the iSense and connect the iPad to your computer to download the files through iTunes like I described. There’s no need to leave the scanner connected as the data is stored on the iPad. Hi there, I have two questions will the files work on a pc if transferred and will the files open up in blender program for 3d object modeling ? Thank you for your awesome info! I’m doing an art project where I want to scan in detail noses using a handheld and 3d print them using silicon. Do you have recommendation for best scanner, software and 3d printer for this? what about iSense software compatibility with IOS 11? It’s 64 bits or 32? Could this stl files use with a wood router to make a wooden 3d sculpture? I would like to buy iPad Air Bracket for iSense. I would like to know if this bracket can be available for online so I can order it. Your post is very high. I like your post and it is provided with lots of great information. so thank you for sharing this great post. Wow. I think my 2-year-old iPhone6 just about sneaks in there. Not that it would be a pleasant experience, but I’m certainly curious after devouring this on the ps4. Best of luck with the iOS release, which is a unique proposition I think. 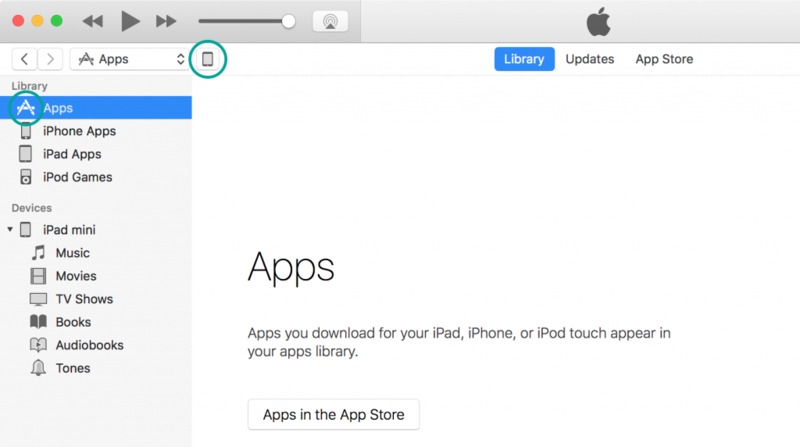 If you have any issue related to apple product contact with Apple Application Support. AOL is the best independent organization that provides AOL Customer Service for any glitches. In case user faces issues with the account can connect with Delete AOL Account. Our qualified technicians who are experienced and provides with best of support services. Wow. I think this Phone8 .Apple have super features.how to setting apple by default yahoo web browser.think a little bit. Apple is more secure than others. how to Yahoo mail account setting apple by default yahoo web browser.think a little bit. Apple is more secure than others. The new enablers of modern digital businesses include a range of computing technologies & infrastructure – such as analytics, Big Data, cloud technologies, and mobile technologies.